Pilot Markers I previously used. We use all four colors: black, red, blue, and green. What is in these markers? Why do I feel nauseous after using them? What do you recommend? Pilot makes two different types of whiteboard markers. The commercial markers, with a metal barrel, have methyl isobutyl ketone, n-butyl acetate, or xylene in different amounts in the four colors. Pilot also makes Wyteboard markers for "home use." These have ethanol and isopropanol as the solvents. 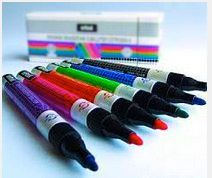 We've received similar inquiries from teachers also using Sanford markers. Sanford makes the Expo Dry Erase Marker with methyl isobutyl ketone and n-butyl acetate as the solvents, as well as the Expo II Dry Erase Marker, containing ethanol and isopropanol respectively. Blackboards and greenboards are increasingly being replaced by whiteboards. Thus, virtually nontoxic chalk is being replaced by markers that have varying degrees of solvent hazards. A distressing trend is that new buildings don't even give the option of old fashioned chalkboards. We recommend using chalk and chalkboards wherever possible, and if these are unavailable, using the whiteboard markers with the least toxic solvents possible. For example, use the "home use" marker by Pilot and the Expo II by Sanford rather than the ketone-based markers. Pregnant women, people on medication with solvent contraindications, and people sensitive to solvents should not work with these. Habits such as always capping the pens when not in use may reduce exposure. If possible, open windows for dilution ventilation. -Ed.